Mamata Banerjee, Chandrababu Naidu, Pinarayi Vijayan, and H D Kumaraswamy requested Modi to resolve the crisis so the "federal structure of the Constitution is maintained". 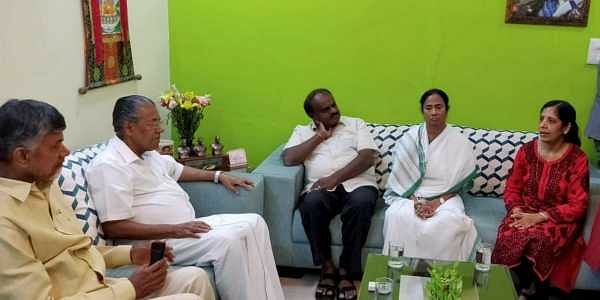 NEW DELHI: Chief ministers of West Bengal, Andhra Pradesh, Karnataka and Kerala today met Prime Minister Narendra Modi today and urged him to intervene for solving the tussle between Delhi Lt Governor and the AAP government, terming it a "constitutional crisis". On the sidelines of the NITI Aayog governing council meeting, West Bengal's Mamata Banerjee, Andhra Pradesh's Chandrababu Naidu, Kerala's Pinarayi Vijayan, and Karnataka's H D Kumaraswamy requested Modi to resolve the crisis so the "federal structure of the Constitution is maintained". "I along with the Hon'ble CMs of Andhra Pradesh, Karnataka and Kerala have requested Hon'ble PM today to resolve the problems of Delhi government immediately (sic)," Banerjee tweeted after meeting with Modi. I along with the Hon’ble CMs of Andhra Pradesh, Karnataka and Kerala have requested Hon’ble PM today to resolve the problems of Delhi government immediately. Yesterday itself, the four chief ministers after being denied a meeting with Delhi Chief Minister Arvind Kejriwal had announced that they will raise the issue with the prime minister. The leaders had termed the situation "unconstitutional" and said the prime minister should make sure that the problem gets resolved. The open support to Kejriwal by the four regional heavyweights - from the Trinamool Congress, Telugu Desam Party, Janata Dal (Secular) and Communist Party of India (Marxist) - comes amid opposition efforts to cobble together a rainbow coalition ahead of the 2019 Lok Sabha elections. Kejriwal accompanied by his deputy Manish Sisodia and ministers Satyendar Jain and Gopal Rai have stayed put at the LG office since Monday demanding that Baijal direct IAS officers to end what AAP described as their "strike" and approve doorstep ration delivery scheme. The West Bengal chief minister also supported Chandrababu Naidu on the issue of 2011 Census being adopted by 15th Finance Commission in the NITI Aayog Governing Council meeting and requested not to penalise the performing states.